Content is king and there is no denying fact about it. The context of content among bloggers is misinterpreted as textual content but anything and everything that we share online is actually a content. If you share a Facebook update as to what you are doing, it is a content. There are certain types of content that work really well with social media. In this article, I will list all the type of content that one can share on social media especially on Facebook. Noah Kagan of okdork.com has shared a research for Facebook posts. The posts that have images are shared more compared to its textual counterpart. Image contents can be engaging with texts, emojis, graphics & other elements to trigger your followers to be more interactive to it. 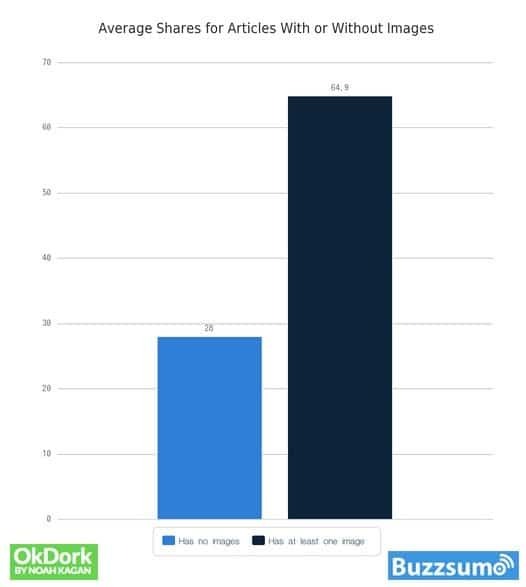 On Facebook, a video is more likely to get viewed and shared compared to an image post. A prank video for the movie Rings managed with 332m views, a Buzzfeed Tasty video showing how to regrow fruit in a kitchen has a whopping 294m views and a recipe for baked apple roses managed 280m views – Says Newshub. Videos engage viewers easily compared to other posts and can keep the visitor stay long on your Facebook post. Instead of sharing a YouTube or Vimeo links on Facebook, upload videos directly to Facebook. Even if you aren’t making a video, you can add 10 best images from the timeline (or from an album) to create a slideshow video out of it. Going live on Facebook is a very hot topic of 2018. A live video is a fun and easy way to connect with customers in real time. You can build a brand with existing or new customers, fans and followers. People love reading and sharing inspirational, motivational, life quotes from famous people & experts. If you can add the image of the author, even better. 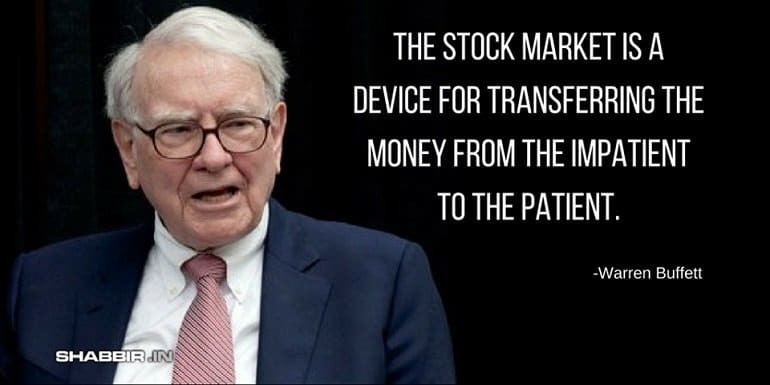 As an example, for my Investment blog, I saw quotes from Warren Buffet really made the buzz among the followers. People love to show off their funny side and so people tend to share and engage more with the content that is light and humorous. One may think that funny content is for viral websites but that is again a misconception. Here is Amul India page that shares a lot of funny content. 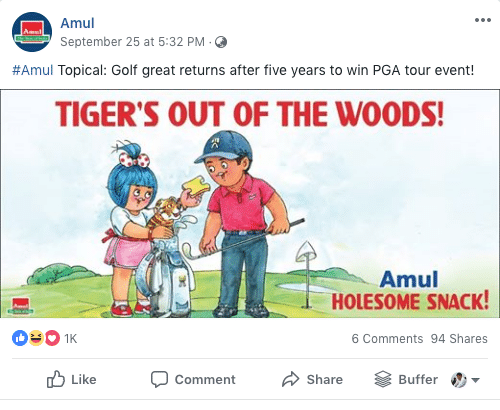 Here is an example of the content shared on the page of Amul India. The content is very interesting, relevant as well as light and funny. It keeps the user engagement going and also helps increase following for the page and the brand. Ask question to understand common questions or queries or pain points of your potential customers. Form a list of common questions and answer them as FAQ. Depending on the type of questions, one can also create a PDF file. The important aspect of asking questions to the fans/followers is they feel part of the conversation. So when you answer those questions, it replicates well within the community. Many people are more than willing to share a view or opinion. It is also a way to ask customers for product reviews. Facebook post that addresses a customer’s problem by offering a solution is an instant hit. For example, an article that reads “Lose 5 inches without going to the gym?” will instigate an instant urge among followers who don’t want to be going to the gym. You may likely have a blog where you share helpful tips and valuable insights on varied topics. Share them on your Facebook page. Integrate your blog post with social media. Create a different image or use the same blog image to go on your timeline. If you don’t have your own blog then you can share articles of other famous bloggers in the niche that will interest your followers to remain engaged. On a side note, a blog can help you earn a living as well. Podcast are hit. People love them. Its a valuable information delivered to your followers in an audio format that one can listen too when they on a commute or in the bathrooms. A podcast is a very popular format for bloggers but any business that want to offer some valuable content to its followers can use it. Infographics are long images that help you to understand a complex subject in an easy-to-understand and visually eye catchy form. They add more value to existing content. Below I have listed some free tools to create an infographic image without any design skills. This works really great. Try them. Or feel free to use any image editing tools of your choice. You can run a poll on Facebook, it’s a fun thing to keep your audience engaged. Make it rewarding and fun participating in it. Some content resonates well with the audience compared to others. Rephrase the original content and reshare them again with the audience or take a fresh approach to the same content and reshare it with the audience. Resharing old content that once created better engagement with the users will definitely increase the engagement again. Latest or trending news stories are hot cakes. We have so many news websites. Share news that is related to the industry which is bound to make some engagement with the audience. Instead of blindly sharing the news, share some short views about the news as well. It helps immensely with user engagement. Here is one of the news links that I scheduled in the morning that went live on one of my page a few mins ago. 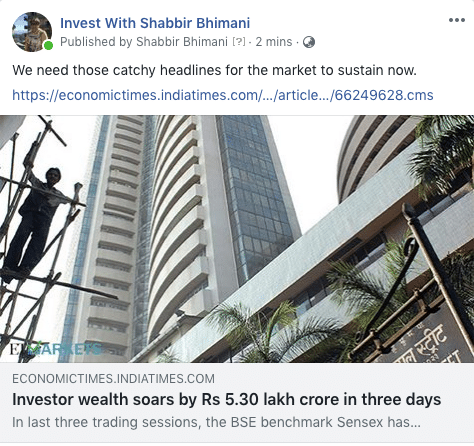 And see how I have added my view about the headline for the market. Think out of the box to offer free giveaways to help drive the engagement. “How-to” guides are step-by-step guides to accomplish a given task. The how-to guide can be in the form of text, videos or slide show. They are more of a Do It Yourself or DIY guides. If you don’t have a blog or a website, it is better to provide the textual guides in the form of PDFs or e-books for downloads but the preferred choice will be to launch your own blog to have these guide as online content. Here is my step by step guide on how to launch your own WordPress blog. Content that has an entertainment value. Often funny content and entertaining content are considered the same but that isn’t true. Even a horror mini movie may not be funny but can be entertaining. So try to create entertaining content for your audience. Facebook is more than just status update. One can share educational content on his/her fan page including but not limited to posting academic lectures, firsthand research, learning games, learning tools, and apps, book review, school and college assignment resources, TED talks, teaching 21st-century skills, brainstorm ideas, exam practice, reading summaries of a reading assignment, broadcasting local (international) school & college news, classroom blogs and so on. You can get more ideas about educational content and post here. A short and sweet story narrated in parts as social media post can create a great impact on the followers. This story can be of a product, it’s manufacturing journey, services that could benefit the buyer at large or about a social cause. Narrate a single story in 3 to 4 different posts (1/4. 2/4, 3/4, 4/4) and schedule the series to be posted every day to keep the users engaged and hooked to the page. Refer to the example of Humans of New York Facebook page where they share many stories as a series of posts. A User Generated Content (UGC) can be defined as the type of content that has been created or contributed by a fan/follower. This can be product reviews, comments on a Facebook post, answers to the question asked on your fan page and so on. There are better chances of audience engagement when you expose your fans/followers with a mixture of professional marketing content and user-generated content. According to Falcon.io “Toyota’s annual “Feeling the Street” campaign is a prime example of a brand doing awesome things with UGC in Facebook ads. Over a period of six weeks, Toyota collected the best user-created content from Instagram and integrated it into standout Facebook ads“. This way Toyota garnered 1.2M likes, comments and shares increasing their ad engagement by 440%. Inside stories can be the entire journey of a company, the idea behind the new innovation or the internal process prior to the launch of a product can help users engagement. A powerful story about your business shall serve a bigger purpose compared to a product or service offered. Memes are a fun way to express emotions compared to written text and this is the reason why Facebook also encourages users to post and share status updates as images. GIF’s are fun ways to interact and increase Facebook engagements among followers. To get started with making your first-ever facebook GIF post I have listed some free tools. Try them. Emotional posts generate the most user engagement. Here is an interesting infographic on how well the high emotional posts produces more engagement. 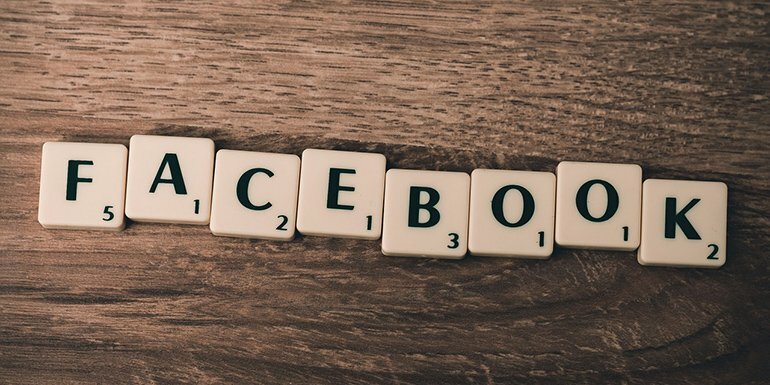 The most important aspect to sharing and resharing content on Facebook is because we find a connection to the post. The connect can be on many different levels like GEO based, concern for a social cause etc. Real life events or people’s experiences where they got influenced by circumstances in a substantial way instigates huge engagement on Facebook. As an example, a fitness expert can document weight loss journey of his/her customer with images, workout videos, diet plans and amount of dedication that pushed them to change their life. A hair stylist can document the change his products has brought it for their customers. Post, share and encourage users to comment on topics that are trending on Facebook. As a technology website, one can always share the details of new iPhone launch topics and can ask for views of their fan followers to keep them engaging.